An electron is the lightest subatomic particle that carries a negative electric charge. It has no known components, which is why it’s considered to be a basic building block of the universe, or an elementary particle. An international research team working on the Borexino experiment in Italy were looking for signs of electrons decaying into lighter particles, but as expected, they came up short. This is actually a good thing because it affirms what physicists have suspected for a long time. Had they found evidence that electrons decay into photons and neutrinos — even lower-mass elementary particles — it would violate the conservation of electrical charge. Such a discovery would suggest an entirely new physics beyond the Standard Model. But the research team did manage to come up with the most accurate measurement yet of the “lifetime” of electrons. Their calculations suggest that a particle present today will still be around in 66,000 yottayears (6.6 × 1028 years), which, as Physics World puts it, “is about five-quintillion times the current age of the universe.” The details of this work now appears at the science journal Physical Review Letters. 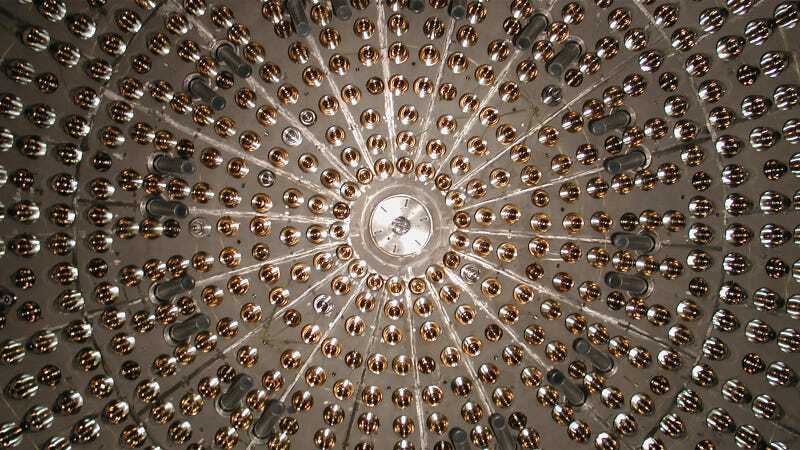 Borexino consists of a shell of petroleum-based liquid that lights up when a neutrino, a nearly massless neutral particle, knocks an electron loose from one of the liquid’s atoms. The detector’s roughly 2000 photomultipliers then amplify and sense the emitted light. [The] researchers calculated the sensitivity of the detector to photons produced via hypothetical electron decays into a photon and a neutrino...They then looked for photon “events” above this background with energies near 256 kilo-electron-volts, an energy corresponding to half the electron rest mass. After looking at 408 days’ worth of data, they found....nothing. But they did manage to determine a mean electron lifetime. Now, this doesn’t imply that electrons will live that long. First, the Universe probably won’t exist by then. And even if it’s still around — say after a Big Rip scenario — the fundamental properties of particles like electrons will likely be entirely different. Second, and more to the point, the new measurements move up the previously estimated lower bound on electron “longevity.” The new figure is 100 times greater than the previous lower limit, which was determined in a similar experiment back in 1998. Put another way, if such a reaction occurs, it must happen less than once every 6.6 × 1028 years. The reason for the hideously long lifespan has to do with the fact that scientists cannot be completely certain that electrons are immune to decay. The observations made by the Borexino researchers — or rather the lack of observations — suggests that, because we haven’t seen electrons decay by now, their lifespans must be at least as large as the new calculations suggest. Decay is very natural in particle physics; heavier particles tend to decay into lighter ones. A neutron left all by itself, for example, will decay into a proton, an electron, and an anti-neutrino in just a few minutes. It’s just the elementary-particle version of the decay of a radioactive nucleus like uranium. But there are some things that seem to never happen, which we describe by conservation laws. For example, the total electric charge doesn’t change. Also the “baryon number” (total number of protons plus neutrons, minus the number of anti-protons plus anti-neutrons), and the “lepton number” (electrons plus neutrinos, minus their antiparticles). Notice this is satisfied by the neutron decay. Before decay we have one neutron, which is charge = 0, baryon number = 1, and lepton number = 0. Afterwards it is also charge = 0 (proton = +1, electron = -1, anti-neutrino = 0), baryon number = 1 (proton = 1, electron and anti-neutrino = 0), and lepton number = 0 (proton = 0, electron = 1, anti-neutrino = -1). But nobody expects charge to change, which is a more robustly conserved quantity. Carroll said the only particles that are lighter than electrons are electrically neutral: neutrinos, photons, gluons, gravitons. If there were other light charged particles, we should have detected them by now. This suggests there’s nothing for the electron to decay into. Email the author at george@gizmodo.com and follow him at @dvorsky. Top image: Borexino Experiment.